Worship and prayer are essential to spiritual growth and hence to Vedanta. They bring grace, without which nothing is achieved. 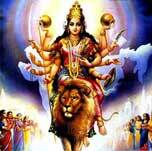 One avenue to grace is the Durga Saptashati (above) also known as Chandi Path or Devi Mahatmyam. This 3 1/2 hour video is of the full puja, except the arathi. It may also be played or downloaded as an audio (mp3) file. Seven Verses, the Sapta Shloki, along with the Dhyana shloka, provide an abbreviated form of the Chandi.